Pretty loaded question for some, we imagine. And we'd love to know your thoughts on the matter (email: leslievillebia@gmail.com). The BIA was instrumental in the creation of the Leslieville Urban Design Guidelines to help developers meet business and community standards as we see them. 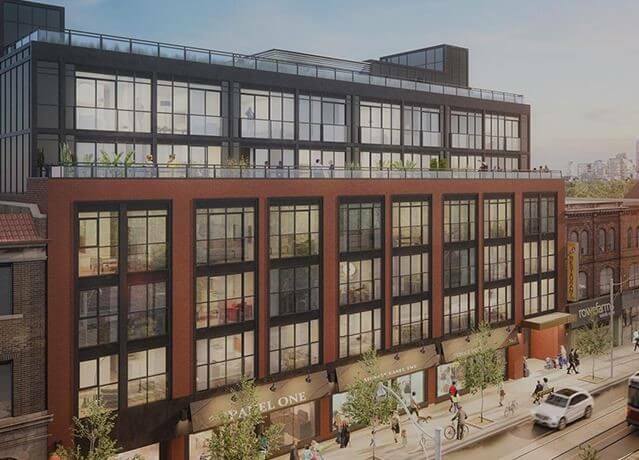 The BIA maintains representation on all area development community liaison committees, so that we can provide insights to developers and understand the impact of new builds on Queen St. E. in Leslieville before, during and after construction. Pictured below is a rendering of 'The Logan', a Daniels Corporation project near the corner of Queen St. E. and Logan Avenue. In addition, we keep a close eye on our storefront activity, and we asked our resident expert, Brad Daniels, Principal of prestige general contracting and construction firm BDA Inc. (Brown Daniels Associates Inc.) - current BIA Board member and Development Committee member - for his take on our changing 'hood. As a founding member of the Leslieville BIA Board, I have a somewhat different perspective on many issues affecting the BIA being the only board member not associated with any BIA business. Since 2006 I’ve been a commercial landlord in Leslieville, and I’ve been an owner of two BIA businesses over the years, but my primary interest in the community has been as a commercial landlord. When I was asked to provide my thoughts for the BIA, it occurred to me that landlords, who are automatically members of the BIA, rarely have their interests, or voices heard in the community. More typically, we hear about the complaints member businesses have with landlords who behave badly. To be sure, there are both landlords and tenants who make poor decisions which affect the life of our community. I have always lived within a five minute walk of a main street in Toronto, and a significant factor in my decision to live in Leslieville was my desire to live in an area with a vibrant and diverse retail/commercial community. I view Leslieville’s restaurants, pubs, galleries, theaters, and numerous retail shops as an extension of my home (I sometimes wonder why I even have a kitchen in my home.) I can walk to almost any place that I might need, or want to go, and I’m very happy to leave my car at home. So when I see vacant storefronts, and businesses closing down or moving to other communities, it makes me sad and sometimes angry. My day to day life is enriched by the presence of successful businesses. The greater in number and diversity, the better. Leslieville has an exceptionally wide spectrum of socio-economic residents and the reflection of that diversity in our business community is one of the things that first attracted me to the community. But as we all know, the community has changed significantly over the past 15 years and it will no doubt continue to. Change brings challenges, and it is always a struggle coping. But hey, what does anyone expect? You can either sit back or complain, or you can work to have a positive effect on the community as it evolves. The city recently removed the property tax relief which had been available to commercial landlords with vacant space. As a commercial landlord I fully support this change. Vacant storefronts benefit no one. Most property owners are motivated by business prerogatives and no one should apologize for trying to turn a profit. It is an interest shared by both landlords and tenants. A landlord may let a retail space sit vacant for a few months in hope of securing a tenant willing to pay a certain amount of rent. If there are no offers, the expectation will eventually need to be revisited. This is really no different than products for sale in a retail store: if they aren’t moving quickly enough, the price is reduced. There is however a big difference in perception between a vacant retail space and an item on the store shelves that isn’t selling. Every retailer and landlord is different, and the motivation and reasoning behind how long they are willing to wait for a paying customer will vary. We all want healthy successful business (and no vacant storefronts) in our community, but the reality will always be that some businesses will fail, and some landlords will allow retail space to sit vacant longer than we would like. As consumers in the community all we can do is try our best to support our local businesses with our dollars. The BIA exists for the sole purpose of providing support to member business and landlords. I encourage anyone interested in contributing to positive change in our community to get involved.